Parties are Akinlagun’s business, and business is good. The British-educated entrepreneur is the director of Nigeria’s largest online alcohol retailer Drinks.ng, which has not merely survived but thrived during a prolonged recession. Sales have increased by around 80% in each of the last two years, says Akinlagun, and the roster of clients has grown rapidly. Drinks.ng provides deliveries to 28 of Nigeria’s 36 states, excepting the embattled Northern regions. The company also operates a 24/7 delivery service within the nightlife heartlands of Lagos, supplying parched partygoers at exclusive clubs, corporate events, and private parties. The director has learned that even in hard times, Nigerian drinkers can have expensive tastes. The vast majority of orders to Drinks.ng sales are for premium brands. Top sellers include Moet champagne, Hennessy cognac and Johnny Walker whiskey, in some cases for over $100 a bottle. Akinlagun acknowledges this restricts his business to the elite end of the market, in a country where over 60% of the population live in extreme poverty. Euromonitor also found growing demand for other premium alcohol products, with the sales value of spirits increasing by 104% between 2011 and 2016, with wine increasing by 115% over the same period. Beer sales climbed by just 51%. Profound social changes underpin these shifts, according to the group’s Africa specialist Ayesha Makuyi. 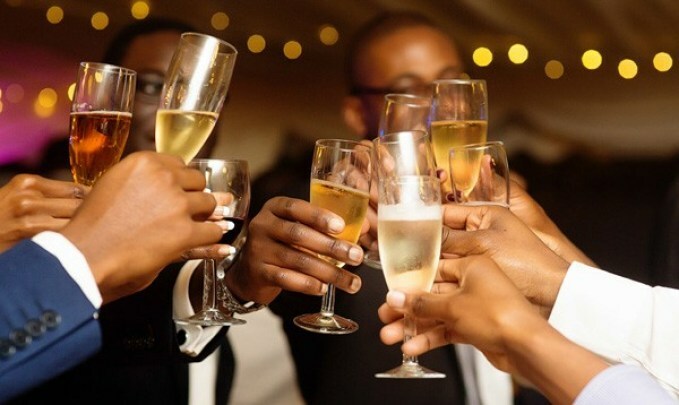 Social drinkers have become loyal to elite products, and less affluent customers aspire to them, says Adeleke Oki, manager of the popular Quilox nightclub in Lagos. The alcohol industry is being propelled forward by rapid advances in Nigeria’s nightlife, particularly in upmarket Lagos. Akinlagun says there are now a dozen nightclubs in the Lekki district alone, compared with just three in 2013 when he started. The recession may have accelerated this development, according to Anthony Shishler, director of operations for Fahrenheit Hospitality, which runs venues such as the exclusive Fahrenheit Loft club. “Many Nigerians usually travel to Europe or the US in summer, but a lot are not traveling now so there is a greater market for us,” he says. Shishler adds that he is seeing a new wave of young, savvy consumers seeking more sophisticated nightlife, which club owners are responding to. Fahrenheit is confident enough to put its money where its mouth is. Shishler says the group is planning to open three new venues in Nigeria. Akinlagun launched his business after being asked to supply alcohol for a friend’s wedding and suffering a bad experience with the informal economy. Much of the alcohol in Nigeria is sold through such markets, and Akinlagun saw an opportunity to modernize the business. Having previously worked with Jason Njoku at the iROKO streaming service, he wanted to provide a similar platform for drinkers. Nigeria’s e-commerce industry is the subject of great hopes and expectations. Government ministers and business leaders have confidently predicted the trade will soon exceed $10 billion a year. Digital shopping platforms such as Jumia and Konga have enjoyed rapid growth. But the industry faces significant challenges. Internet penetration covers just 47% of the population, according to NGO Freedom House, and around 40% of Nigerians don’t have bank accounts. Where consumers do have access to banking and internet, “the prevalence of internet scams and fraud…make many people reluctant to enter card details online,” a recent Price Waterhouse Cooper report noted. But the alcohol market has shown promise. Internet retail has been the fastest growing mode of distribution for alcohol in Nigeria, a Euromonitor analyst told CNN, and progress is projected to continue. Akinlagun is determined to keep challenging the informal economy with wider coverage, more enticing offers, and new luxury products such as rare Japanese whiskey. Up to this point, Nigeria’s party people have not let him down.